You're Invited - 1st Annual OBF Golf Scramble! 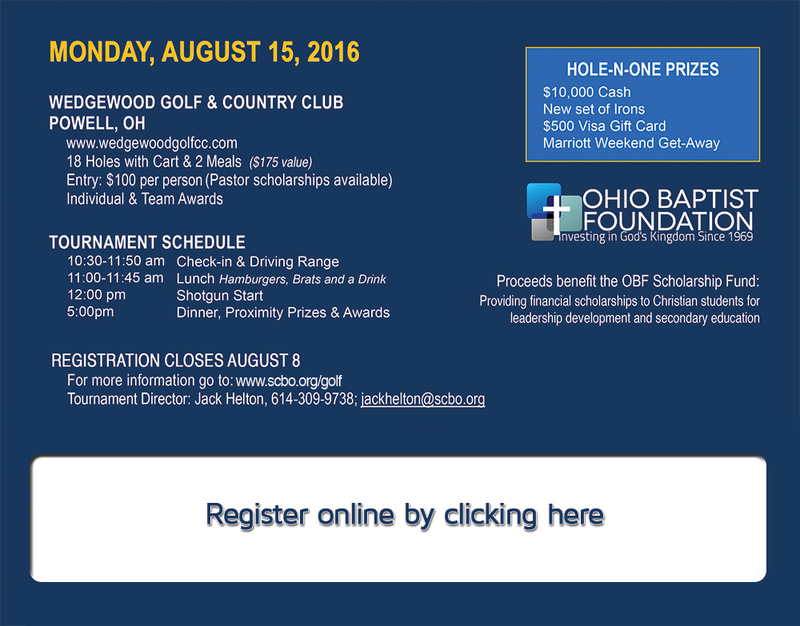 I am excited to invite you to participate in the inaugural Ohio Baptist Foundation Golf Invitational to be held Monday August 15th at the prestigious Wedgewood Country Club in Powell, OH. Your entry fee of $100 includes range balls, lunch, dinner, door prizes, and a great day of fun and fellowship, not to mention playing on a great golf course! Register as an individual (I'll put you on a team), or bring your own foursome. Proceeds from the event will provide scholarships to Christian students attending colleges and leadership development events. There is also the possibility that a famous sports personality might be with us to say a few words at dinner! Spots are filling up quickly so register as soon as possible (registration closes August 8th).